Another view. 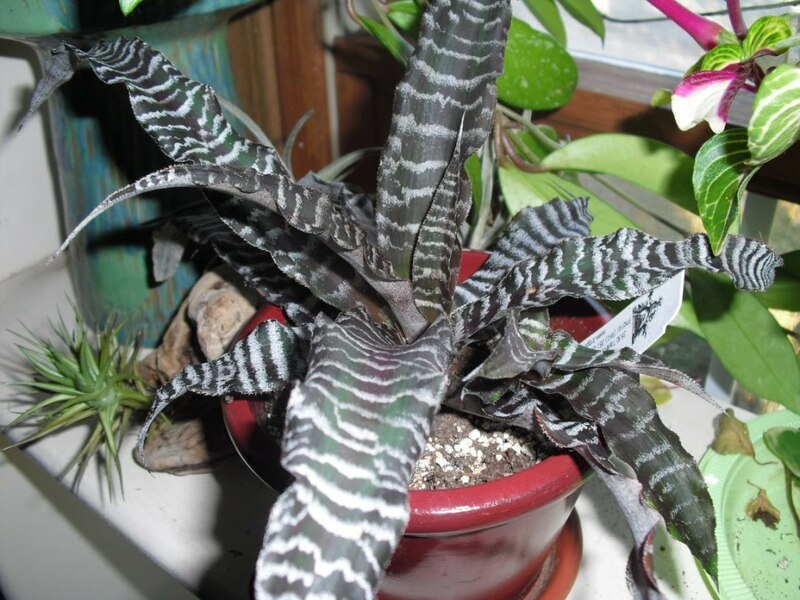 It is a fairly small plant in a 4-inch pot. I love the color and striped pattern, and it has been extremely easy to care for. I had seen pictures of similar Cryptanthus in vintage houseplant books, but never any for sale until recently. I had just purchased this one by mail order, when I visited a new nursery and saw a few for sale there as well. I hope more species and varieties become more readily available; they are wonderful plants. My other Cryptanthus, a more commonly available red and green variety, which I've had for a few months. It bloomed over the summer. This is what it looks like now, spent, but still showy. The blooming rosette itself should still last for months, and there is a large pup coming up on the side to carry on when "mom" succumbs. Neoregelia 'Toucan' The original rosette is on the left, the new offset is on the right. 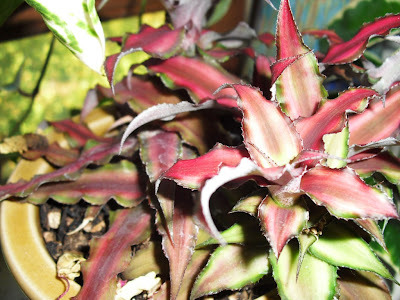 This plant seems to be the most easygoing of my Neoregelia varieties. There have been no drying leaves on the original plant, and the offset is growing fast. It is just starting to get the little red points on the leaf tips, and has a nice blush in the center that the original plant didn't have. 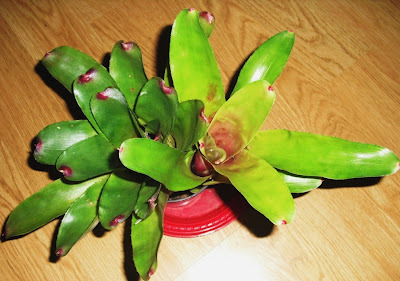 Last but not least, here is the plant that kicked off my Bromeliadmania, a Vriesea splendens I found in the grocery store last January. Not only has it survived for more than the six months I rather pessimistically predicted, it has done really well. 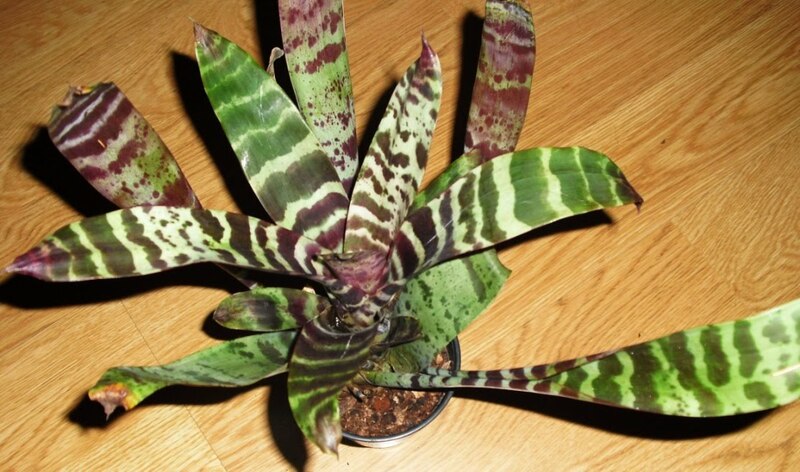 Vriesea splendens. The outer ring of leaves is the original plant, the center leaves are new growth. Apparently pups form more or less in the center of the "vase" rather than to the side. So the plant seems to constantly renew itself. 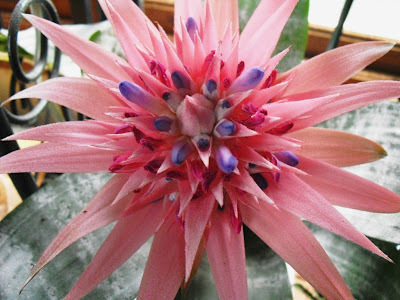 Most of my other Bromeliads are also doing fine. I've kind of decided that right now, I have about as many plants (of all types) as I can handle. (Maybe more, if you've read my rather self-pitying reply in the comments to my recent Anthurium post.) 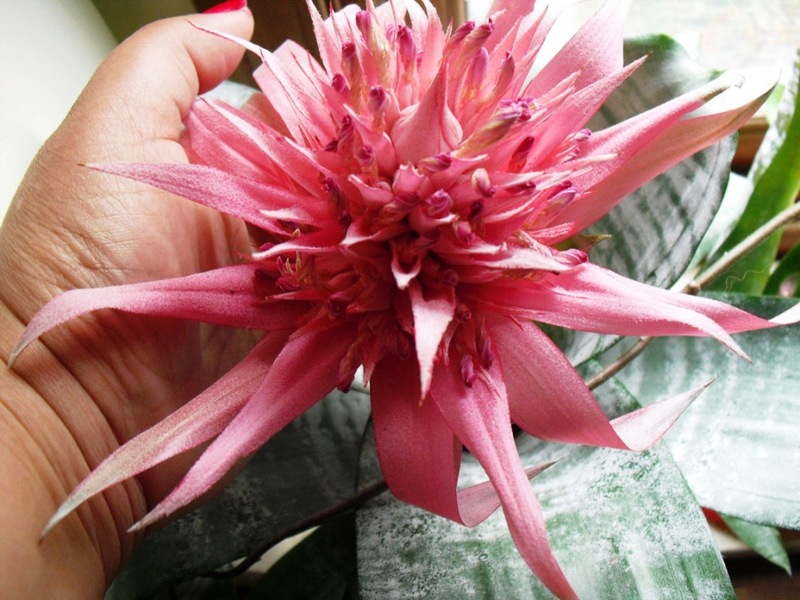 But a being a crazy plant lady, I can always be tempted if the right plant comes along. Especially if it is a Brom. they r all so beautiful, karen. i really love your Vriesea splendens!!! i must keep an eye out for one! 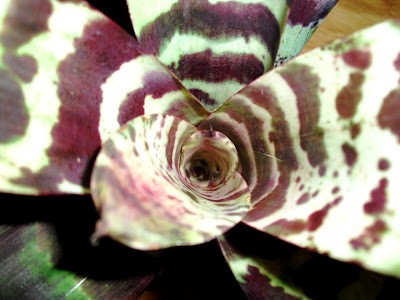 Bromeliads are my favourite houseplants. 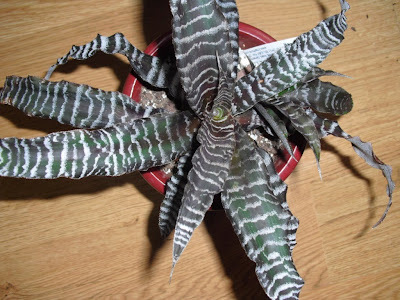 Love that Cryptanthus 'Black Mystic'. I've never seen it in any greenhouse; must keep a lookout for it. Water Roots, after buying that Cryptanthus by mail from Tropiflora, I visited a local nursery I had never been to before (thought they were outdoor plants only) and found that they had 'Black Mystic' for sale. So you never know.